I tried several times to send my information through Adafruit cloud at no avail. I bought the Weather station at Kickstarter. From my best knowledge I only need to replace the AIO key with my own. I downloaded the last img file from your site and checked every single dependency and theoretically I'm good to go. Adafruit and my RPi 3 are on the same network and so on. My OLED screen is Ok, my daa is showing and so on. I understood from the previous thread that you spotted an error . "IOadafruit don't display pres-loc1 graph"
So I kindly request that you deliver a new "*.zip" or "*.img" with the last modifications since the one in the site is dated from October 2018. 1, The RPi3 works great, checked the logs, no errors and frills. 2. 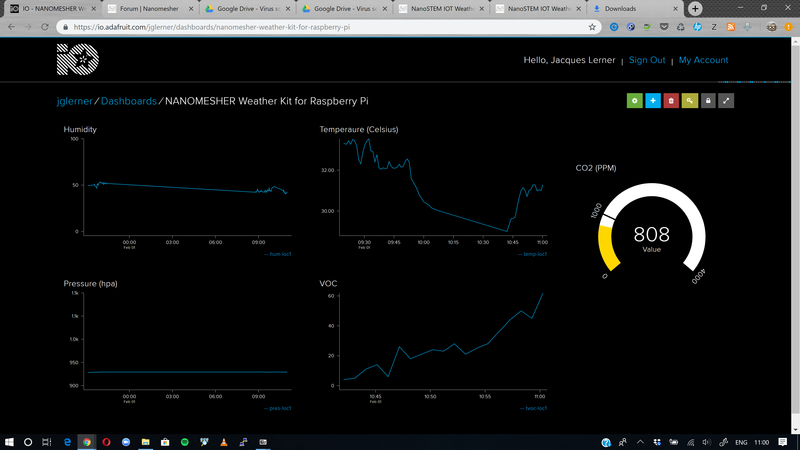 In spite of creating the "*-loc1" files, imported the AIO key and so on nothing flows from IOT Weather Station to Adafruit. As a last try I'll try to create myself using Method 2 starting from the last Stretch Lite and try to have it funcional. Meanwhile . I think that a new image would be easier for an "one step" solution.